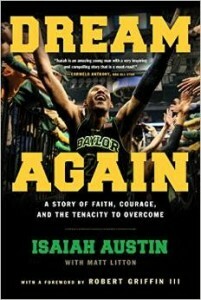 Before I first met Isaiah, I was told that Marfan syndrome had left him, in essence, with a “heart condition.” When I first arrived at Baylor’s gym, I watched Isaiah, the most talented basketball player on campus (likely any college campus), who was still grieving the recent news that he would never play ball again, on the floor wiping up his teammates’ sweat during drills, running to grab water for them during breaks, pulling the younger players aside to encourage them, and setting the overall tone with his intense presence. I got to know a young man who is committed to being a servant leader and whose optimism and sense of humor lifts up everyone around him. I don’t know what challenges Marfan syndrome will bring him in the future, but let me tell you what I learned about Isaiah Austin’s “heart condition”: his heart is full of more joy, passion, and genuine faith than any young person I’ve ever met.